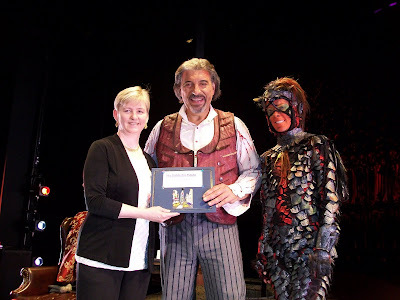 The big name this year in the Public Theatre’s Shakespeare in the Park production of The Merchant of Venice is Al Pacino as Jewish moneylender Shylock. He played the part to critical acclaim in the 2004 film and he is, after all, Al Pacino, so he gives a very good performance, despite an accent that fluctuates between a Jew and something else, but I’m not sure director Daniel Sullivan coaches more out of him than anyone else might have given to the part. I kept hearing raves, even as I avoided reading reviews before seeing the show. Everyone was talking about the performance, but after seeing it, I couldn’t help but think, “Raves? Really?” Respectable, sure, but I didn't see anything that made me say, "This is the best Shylock ever!" Maybe it’s hard to know what to expect from such a strange character in such a strange play. Shylock agrees to lend money to his hated enemy, Antonio (Byron Jennings), who seeks the money for his friend, Bassanio (Hamish Linklater), so that he can marry the beautiful heiress Portia (Lily Rabe). In return, Antonio agrees to pay with a pound of flesh if he defaults on the loan. Meanwhile, Portia, in love with Bassanio, has her own problems. Her father’s will states that she can only marry the man who selects correctly from three small caskets, gold, silver and lead. One contains Portia’s picture and the man who selects correctly wins the girl. Attempts by the Prince of Morocco (a very funny Nyambi Nyambi) and the Prince of Gobbo (Jesse Tyler Ferguson) are unsuccessful. The process is overseen by Portia’s servant, Narissa (Marianne Jean-Baptiste – here, in truth, is the standout performance of the night. She's fabulous.) When Bassanio chooses the right box, he and Portia are wed and so are Narissa and Bassanio’s friend, Gratiano (Jesse. L. Martin). But not all is happy in Venice. Shylock’s daughter, Jessica (Heather Lind), converts to Christianity and elopes with Lorenzo (Bill Heck) with the help of some money she steals from her father. Meanwhile, Antonio’s assets, with which he was to repay the loan, are lost at sea. Refusing to show any mercy and relishing the thought of cutting out Antonio's heart, Shylock refuses offers of cash from others to repay the loan and demands his pound of flesh. Will the knife-sharpening madman get to take his just reward from the captive Antonio or will Narissa and Portia, disguised as men (so Shakespeare) save the day? themes and Shylock’s subsequent forced conversion to Christianity, this one from the bard is a little out there. The production is very well done, though, admittedly, it’s hard not to like anything at the Delacorte Theater with all of Central Park as the backdrop. Mark Wendlend’s very slick, moving iron-gate set steals the show, though a strange-looking electric device in the torture scene is somewhat unclear in nature and looks more like a giant teapot at first. Jess Golstein’s costumes leave us wondering what time period we’re in: the men all wear suits with long morning coats and the women’s dresses suggest 19th century, though the original play is set in the 16th century, when the Inquisition and a forced baptism might be more at home. A very satisfying production, a good, if not rave-generating performance from Pacino and a performance that deserve raves from Jean-Baptiste combine to make this time well spent (it’s three hours, so get a sitter for the little ones). 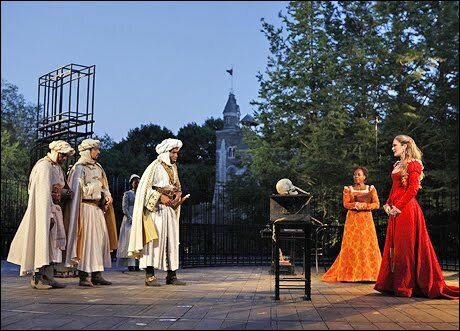 The Merchant of Venice is running through Aug. 1 in rep at the park with The Winter’s Tale. at the Delacorte Theatre, Central Park, near 81st Street. Tickets are free and are distributed to those waiting in line at the park or through a virtual line online. 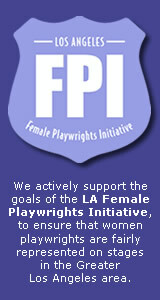 Visit http://www.publictheater.org/content/view/126/219/ for more information. • The scene where Shylock prepares to take his pound of flesh is a little creepy. No additional notes. Ruben Santiago Hudson plays Leontes, king of Sicilia, who is filled with rage when he becomes convinced his wife, Hermoine (a very good Linda Emond) and his longtime friend and King of Bohemia, Polixenes (Jess L. Martin) have had an affair producing Hermoine’s unborn child. He imprisons her, and when she delivers a daughter, her friend, Paulina (Marianne Jean-Baptiste in a captivating performance) takes the baby to Leontes hoping he’ll accept her as his own and forgive Hermoine. Instead, the king orders Pauline’s husband, Antigonous (Geryy Bamman) to remove the girl, named Perdita, and he takes her to Bohemia where he is killed by a bear, in one of Shakespeare’s more well known scenes. Meanwhile, Hermoine’s young son, Mamillius (Alexander Maier), becomes gravely ill after being separated from his mother and when he dies, Hermoine, in grief, follows him. To compound Laontes’ guilt, the Oracle of Apollo sends word that Hermone and Polixenes were innocent. Fast forward 16 years and the now grown Perdita (Heather Lind), having been raised as the daughter of the shepherd who found her (Max Wright) falls in love with Bohemia’s son, Florizel (Francois Batiste). The king opposes the marriage. Will true love win? Will everyone end up dead at the end of Act 2, which so often is the case in a Shakepeare tragedy? You’ll have to sit through the three-hour-and-10-minute production to find out, but I will tell you that this one ends a little happier than most. Much of the fun of the evening comes from the clowns: Jesse Tyler Ferguson as the shepherd’s son and Hamish Linklater as a thief and rogue . Director Michael Greif does a nice job staging the piece on Mark Wendlend’s impressive set that includes firepots, smoke effects and a glass panel that raises up to allow for additional depth of staging and a thunderstorm behind it. He also uses puppetry by Lake Simons to fly in birds, graze some sheep and depict the bear attack. Tom Kitt’s original music sets the mood, and costumes by Clint Ramos, with some lovely flowing gowns, complete it. The Winter’s Tale plays as part of the Public Theatre’s Shakespeare in the Park through July 31 at the Delacorte Theatre, Central Park, near 81st Street. Tickets are free and are distributed to those waiting in line at the park or through a virtual line online. Visit http://www.publictheater.org/content/view/126/219/ for more information. Note: While I usually applaud parents who bring children to see classical theater, I would suggest that this one, particularly with it's three-plus hour run time that starts at 8 pm, is probably not the best outing for little ones who will need to remain quiet while being up way past their bed time. A.R. 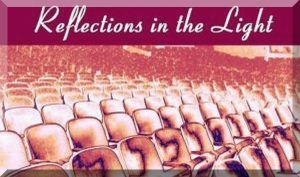 Gurney’s nostalgic tribute to a real-life encounter he had backstage with Katharine Cornell, first lady of the theater, shortly after World War II as told in the world premiere of The Grand Manner, playing Off-Broadway at Lincoln Center, is sentimental and sweet, but doesn’t seem as grand as some of his other works, (Sylvia, Love Letters, The Cocktail Hour), so rich in humor, character development and snappy dialogue. Instead, it plays out more like someone's very long story during which the mind wanders triggering guilt because it’s a worthy story, but since you don’t really know the folks involved it has a “you-had-to-be-there” feel to it that keeps you from fully appreciating it. 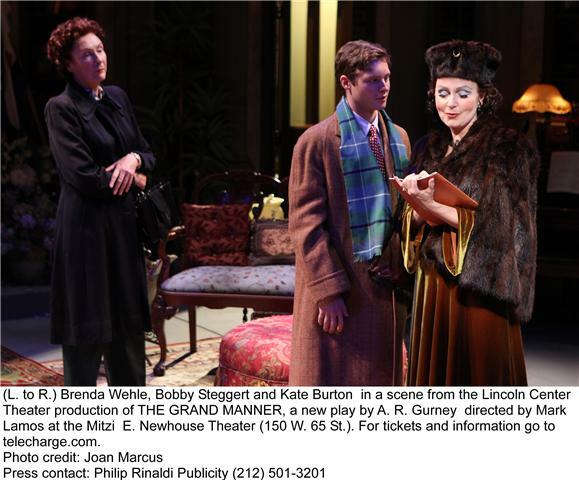 Wisely, the play is 90 minutes without an intermission and the performances, directed by Mark Lamos, are fine. Bobby Steggart (who stole scenes in Ragtime and Yank! 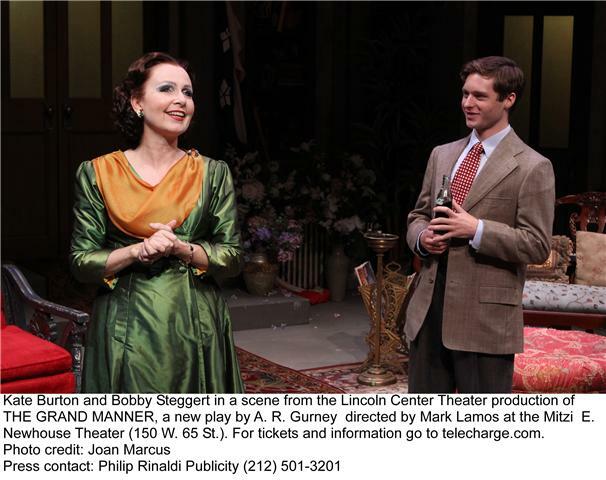 last season) plays young Pete (Gurney), who travels from his New England boarding school to New York to interview Cornell (Kate Burton) for a school project. He gains backstage access thanks to a letter of introduction from his grandmother back in Buffalo, Cornell’s hometown. Brenda Wehle plays Cornell’s assistant, Gertrude Macy, and Boyd Gaines is Cornell’s husband/director Guthrie McClintic. Some controversy ensues when Pete reveals that McClintic has cut some of Cornell’s seductive lines from Shakespeare's Antony and Cleopatra. He doesn’t think they suit her "grand manner" and Pete doesn’t help matters when he equates Cornell age-wise with his grandmother. Some of the characters' needs and secrets are revealed (none of which are surprises at all, especially one telegraphed by costuming designer Ann Houd-Ward) and Cornell inspires Pete to become a playwright. It’s sweet, and John Gromad provides some nice original music and sound. John Arnone’s set is pretty grand for what I presume is a "grand manner" star's green room (the chaise needs some cleaning – it’s terribly stained) but the story doesn’t stay long with you once you have left the theater. 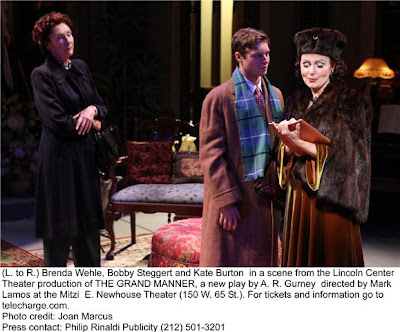 The Grand Manner runs through Aug. 1 at the Mitzi E. Newhouse Theater, 150 West 65th St., NYC. Tickets can be purchased by calling (212) 239-6200; Outside NY: (800) 432-7250. Note: David Cromer's production is the best I've ever seen of this play. His direction is phenomenal. Anyone who has ever seen or been in a production of Our Town should see the Barrow Street production. Truly, it's the one by which all others will be measured. Helen Hunt joins the cast of David Cromer’s acclaimed production of Thornton Wilder’s Our Town, for four weeks only (Tuesday, July 6 to Sunday, Aug.1), at the Barrow Street Theatre, succeeding Michael McKean, who gave his final performance on Sunday evening, July 4. Ms. Hunt becomes the sixth actor to assume the iconic role in this record-breaking production. Hunt performed the role of ‘Emily’ in the Tony Award-winning Lincoln Center Theatre production of Our Town, in which Spalding Gray was the Stage Manager. (Cromer has dedicated his production of Our Town to the memory Spalding Gray). Hunt’s last Broadway appearances were in Yazmena Reza’s Life (x) 3, and as ‘Viola’ in Lincoln Center Theater’s production of Twelfth Night. 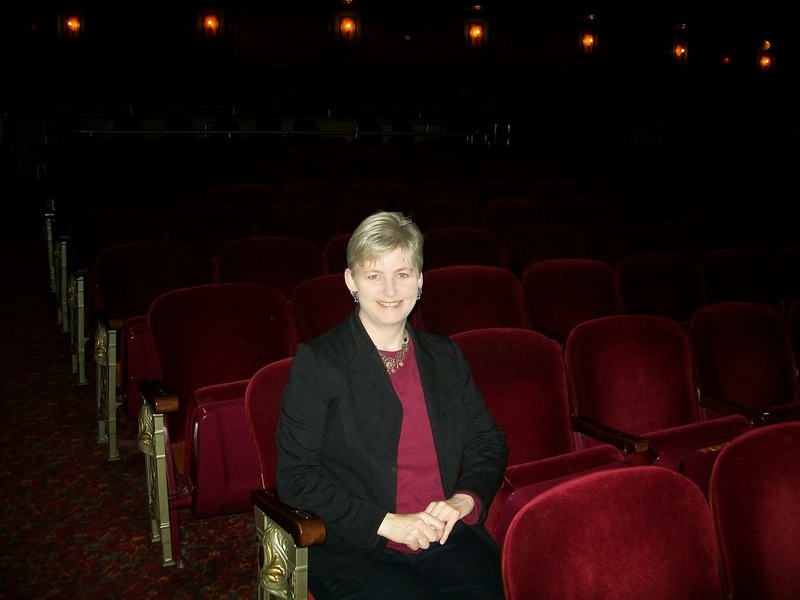 The New York production of Our Town began performances on February 17, 2009, and went on to win the Lucille Lortel Award for Outstanding Production and Outstanding Direction and Obie Award for Outstanding Director. The performance schedule is as follows: Tuesday – Friday at 7:30 pm, Saturday at 2:30 and 7:30 p.m., Sunday at 2:30 and 7:30 pm. Tickets are priced at $69 & $49.50 and are available through SmartTix (212) 868-4444, http://www.smarttix.com/, or at the Barrow Street Theatre box office (open at 1 pm daily). Student tickets at $20 are available on the day of performance only at the box office. Tickets now on sale through Sept. 12, 2010. Barrow Street Theatre is located at 27 Barrow St. at 7th Avenue South in the heart of Greenwich Village, NYC. Nearby subway stops are the 1 at Christopher Street (walk 1 block South on 7th Avenue to Barrow) and the A, C, E, B, D, F and V at West 4th (walk West on 4th Street, left on Barrow). The Lights are Bright on Broadway! Max McLean, Kia Corthron Receive "The Lights are Bright on Broadway Awards"
Max McLean, star of "The Screwtape Letters" and Kia Corthron, author of the play "A Cool Dip in the Barren Saharan Crick" received Masterwork Productions' 2010 "The Lights are Bright on Broadway" awards, presented to individuals and organizations making a difference in the Broadway community through their faith. McLean, above, was joined on stage at the Westside Theatre, where The Screwtape Letters currently is playing, by co-star Karen Eleanor Wight, right, who plays his assistant demon Toadpipe in the production (co-adapted by McLean with Director Jeffrey Fiske) of the C.S. Lewis book. The award was presented by Masterwork Executive Director Lauren Yarger, left. 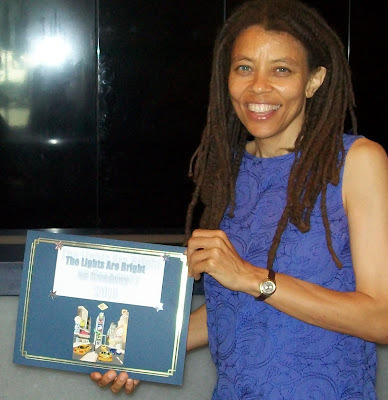 Corthron, pictured below, was honored at Playwrights Horizons, where her play ran earlier this season and was honored for its positive depiction of main character Abebe, an African preacher in training, and the sharing of his faith. Tourists flock to the Big Apple every year to take in its wonderful sights, and hopefully, some great theater too. That season is upon us, as schools let out and the Fourth of July is right around the corner. There was a time when I would have picked you out as a tourist (yes, you look like a tourist – whether you are visiting from another country or just another state) and said, “Oh, no. 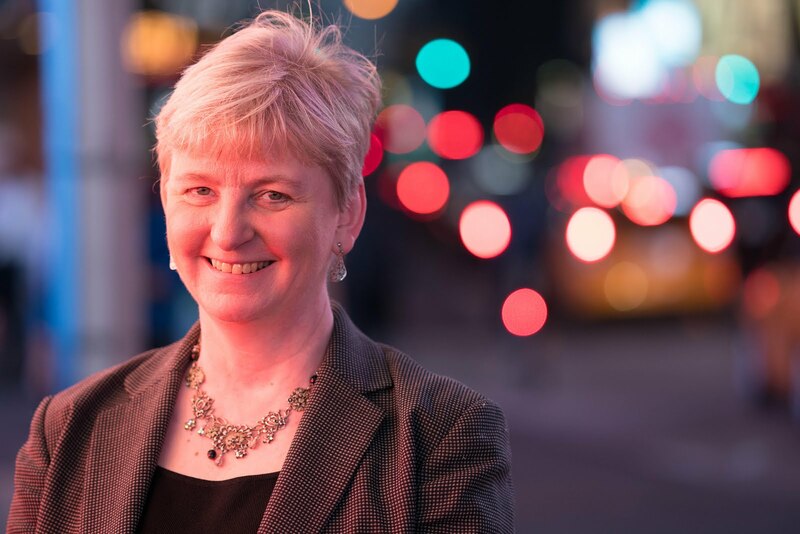 A tourist.” Once, I advocated making Broadway open to visitors, but banning them from Seventh Avenue and requiring ID cards for New Yorkers (and by this term I mean those who live and work there) for access just so I could walk unobstructed when needing to be in the touristy parts of the city. New Yorkers have a reputation for being unfriendly, but I personally know this isn't the case. Most New Yorkers are more than willing to assist you if you try just a little not to be annoying. Tourists often get in the way and make us late for appointments. Rather than avoiding you as an annoyance, however, I have come to realize that we need you. The economy is in the pits -- New York’s in particular -- so the city, and the Broadway and the theater communities, need tourism to keep thriving. Thus, I’m willing to bite my tongue, show a little patience and try to be helpful. In print, I’ve shared information about what shows to see and a special tour of Little Italy to entertain you (and get you to spend money) while you’re here. I also have been helpful in person. Recently I redirected a group of international travelers who had been waiting, for a few days I believe, for a B train that never was coming to that station. I also aided a woman who was stuck in the turnstile at the subway, also for days I believe, after having caught the handle of her suitcase in the turning mechanism. I’d like some credit, please, for going out of my way to help those visiting the city, even though I once might have had more fun giving them directions to 42nd Street that in reality, would have put them on a quick ferry to Jersey. Tip #1: You are not the only person walking in New York today. Oh, I know you think you are because you do things a person aware of other people on the planet wouldn’t do, but I’m here to help. Perhaps you are visiting from somewhere where you can walk along the streets of your town or village without meeting anyone else, but in New York, there are about a million other people walking along with you. The best advice I can give you is STEP OUT OF THE WAY! Top #2: Go. Don’t stop. New York has many interesting, breath-taking and downright bizarre sights. You will see very tall buildings, bright lights, celebrities, men dressed like women, women dressed like men and some people not completely dressed. If you see one of these things, your impulse will be to stop and gape, point them out to your tourist friends or take a photo of them. If you decide to do any of those things, first STEP OUT OF THE WAY! Never stop in the middle of pedestrian traffic or someone will put you on a ferry. Tip #3: These rules are made for walking. Follow them or you will fall down or cause someone else to fall down or be responsible for a collision. • Always walk perpendicularly to the street. If you suddenly cut a diagonal to get to a store or a tourist site, you’ll knock a bunch of us down. Make a diagonal approach by taking a few steps forwards and a few steps over until you reach your destination. Also, generally speaking, follow the same rules for driving while walking. Walk on the right side of the sidewalk. Pass left. • Never walk backwards. You are not the only one on the sidewalk (see Tip #1). You will definitely crash into someone and if it’s a New Yorker, they definitely will be annoyed. • Don’t walk while trying to take a photo. First STEP OUT OF THE WAY, then take your shot.  Are you from New York? If the answer is no, you are walking too slowly. 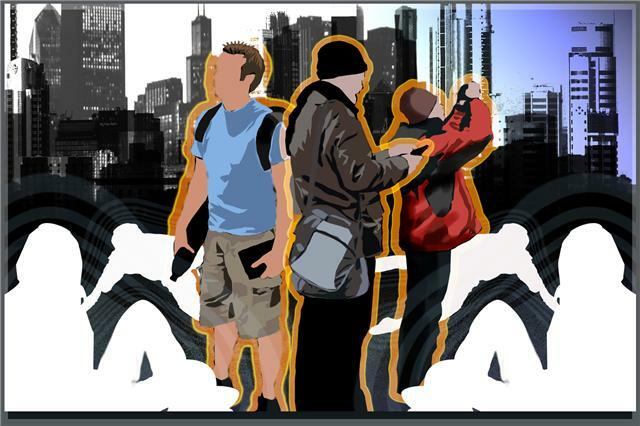  Glance behind you (don’t walk backwards, see above) while continuing to walk, (see Tip #2). 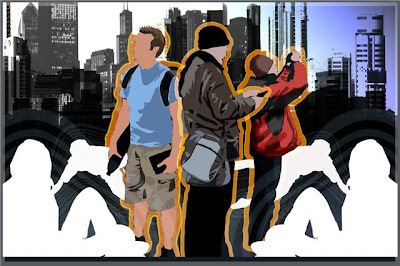 Are people piled up, dominoed on the ground behind you or looking at you with hatred in their eyes? If so, you’re walking too slowly. • Never cross the street when you don’t have the “walk” signal – unless there are no cars coming. In New York, if vehicular traffic is clear, pedestrians cross, regardless of whether the light is green. This differs from other cities, like say Washington, where I amusedly watched crowds waiting on the corner for the little count down signal telling them they had permission to cross, despite the fact that there were no cars any where in sight. This happened even at the corner of the White House, where barricades prevent any cars from driving through the intersection, but where people waited for the light to cross any way. Perhaps wasteful bureaucratic procedure is catching there. Or maybe nothing gets done in Washington because everyone is still waiting to cross the street. I’m not sure, but I guarantee you, it’s different in New York. If you’re unsure about whether you should cross STEP OUT OF THE WAY! And stay out of the curb cuts. People wheeling carts and using wheel chairs, for example, needed to cross at those spots. • Never walk hand in hand or wrap your arms around each other unless you’re prepared to do so single file. Linking together horizontally forms a wall around which those behind you can’t get past. If you crave closeness, STEP OUT OF THE WAY! • If it’s raining and you need to use an umbrella, remember, you’re not the only one walking on the sidewalk (see tip #1). You’ll need to angle your umbrella to prevent catching it on anyone else’s. Two umbrellas held straight up will collide as you pass. If you are not adept at manipulating umbrellas in traffic, don’t use one or STEP OUT OF THE WAY! Take shelter by spending some money at a coffee shop or restaurant until the clouds part. Tip #4: You can get there from here. If you are lost and need to check your I-Phone GPS, street signs or one of the many maps you are carrying for directions, STEP OUT O F THE WAY! No one behind you will suddenly stop because you are lost. The subway system can be very confusing. Check out routes BEFORE you get on a train and check for service changes, especially on the weekend (that’s how those poor international tourists came to be waiting for three days for the phantom B train). If you’re not sure whether you’re on the right train STEP OUT OF THE WAY so people who do need that train can get on. If you end up at Grand Central Terminal and you see a person running, STEP OUT OF THE WAY. This person is running to catch a train and you will be in the way while you are attempting to take a photo of the constellations painted on the ceiling. (see tip # 3 about STEPPING OUT OF THE WAY while taking photos.) I’m a kind person, but I will mow you , your elderly grandmother and your camera down if you get between me and the 10:22 to New Haven. Tip #5: Have a great time and see lots of theater while you are in the city. Buy full –priced tickets online before you come to the city to guarantee seats. For discounts online, visit http://www.givenik.com/index.php/Masterworks. Discounts also are available the day of the show at the TKTS Booth at Times Square. Broadway is the best there is when it comes to theater and Off-Broadway has some terrific offerings too (see tips for which shows to see here). Tip #6: When all else fails, STEP OUT OF THE WAY! • The Westin at 43rd Street and 8th Avenue. http://www.westinny.com/. Reasonably priced, central to the theater district. Friendly, accommodating staff. • The Michelangelo, 152 West 51st Street. A little more pricey, but they often have some really great packages and offers. http://www.michelangelohotel.com/. Walk to Rockefeller Center.